One of the best standard paleo meals one can possibly have is a nice big salad made with fresh, colorful, nutritious vegetables and other nifty add-ons like berries, nuts, or even sardines. Unfortunately, even though my taste buds have become more sensitive to the natural sensations of fresh veggies, I still have found it difficult to get myself excited over salad. Part of the problem is that most of my life conditioned me to expect flavorful dressings on top of said salads. I do enjoy vinegar and in a pinch will toss some good olive oil and red wine vinegar on a salad, but I miss the flavors of more complicated dressings. The vast, vast majority of store-bought dressings, though, proudly proclaim themselves to be low-fat, which is a dead giveaway that they are filled with crappy rancid vegetable oils and sweeteners like HFCS. You can make your own dressings, of course, but I have had trouble mustering enough effort to do so regularly. Over the last few years, I have kept my eye out for possible pre-packaged paleo dressings, but didn’t hold up much hope for success. 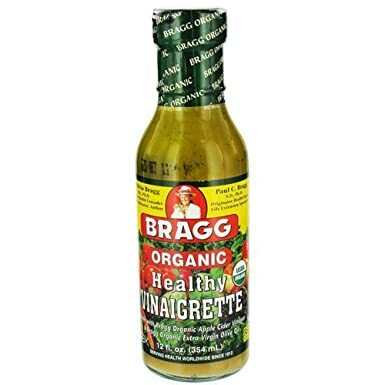 Ingredients: Bragg Organic Apple Cider Vinegar, Bragg Organic Extra Virgin Olive Oil, purified water, organic honey, organic garlic, Bragg Liquid Aminos (vegetable soy protein & purified water), organic onion, organic black pepper and natural xanthan gum. No heavy sweeteners, no artificial sweeteners, no crappy vegetable oils. Pretty much the only non-paleo thing is the aminos, since they make theirs from soy protein. But I personally find that I do ok with a little bit of soy product (such as soy sauce), and its pretty low on the ingredient label anyway, so I was willing to give it a shot. 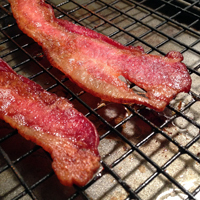 The hardest thing about going paleo was learning to cook–and I mean really cook–for the first time in my life. No one in my family cooks (or, at least, not well), so I had to teach myself from scratch using books, websites, tips from friends, and Gordon Ramsey cooking shows (wherein I learned the most important part of cooking is yelling at people). Luckily, somewhere along the way I discovered I have a real passion and creativity for cooking. One thing I’d to do with this blog is share some interesting tips and techniques I’ve come across in the hopes that they help others who also starting from nowhere. Maybe by pointing out the paths that I took, it will lead other people to similar passions of their own. Anyway, one of the key things I have been learning about along the way is kitchen tools that are essential in a paleo kitchen. Most guides to kitchen supplies out there are written by people who assume a certain minimum of baked goods and pasta in the average kitchen and underestimate the amount of rendered animal fats I have building up on my cooking surfaces. I am also a kitchen minimalist and dislike buying so-called “unitaskers” to clutter up my drawers. So I intend to only recommend supplies that are particularly useful to our unique needs and are an efficient addition to your kitchen. 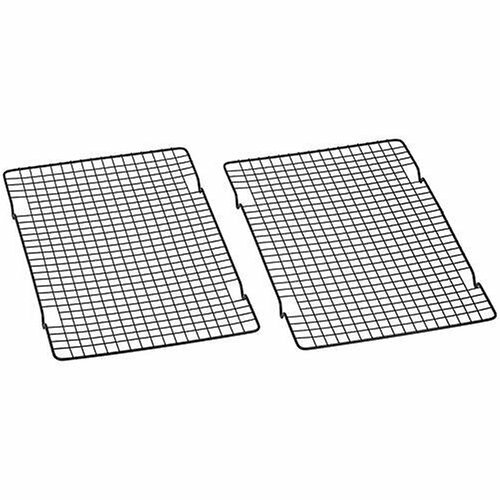 Today I am discussing one of my first unique purchases, and still one of my favorite: my wire baking racks. I do love a good rack. My Marin Sun Farms CSA shipment comes once a month, frozen and packaged in a big box. I get a random selection of cuts, but I can put in orders for specific additional things as well. This month, they emailed us saying they were having a sale on oxtail, 30% off. As I may or may not have mentioned, I’ve been fascinated with reading about offal cuts of meat that have fallen out of favor in the American diet. Usually they are cheaper and much more nutritious than regular, mid-muscle cuts. Many times they need some more specialized cooking techniques, but I’ve become gradually less frightened and intimidate by this over time. I mean, I have a crockpot! What can’t I do?